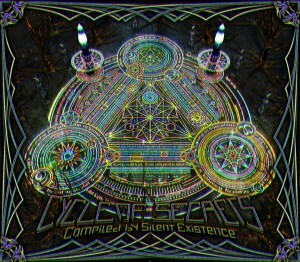 Cycle Of Secrets is an enigmatic exploration of cutting edge forest music and dark psychedelic trance compiled by Silent Existence. Conjuring the deepest mysteries of time and space, these grand wizards of the transcendental arts will employ complex sound manipulations and masterful storytelling to test the mettle of initiates worldwide. Those with the capacity to endure and overcome the trials and challenges that lie ahead may gain insight into the universe and uncover wisdom buried within themselves–but there is no guarantee that the most profound secrets will ever be revealed. Mastered by Makus (Overdream) @ Sky Gravity Studio with artwork by PsyPepper. MP3 Download | FLAC Download | WAV Download · Download count: 55,732. Released under a Creative Commons licence for noncommercial usage. This compilation builds on the great success of last year’s Energies Around, another release designed to please all listeners of psytrance worldwide. All the best to Trimi and all the artists! All the best Silent Existence! forgot the massive thanks to all the artists producing these sounds!!!! ooohh ahhhh!!! yes!!! and some of these bad boys are play cosm festival in june!! from costa rica!!!!!!!! yeah!!!!!!!!!!!!!!!!!!!!!!!!!!!!!!!!!!!!!!!!! great compilation!!!! Awesome Job Guys!!! Really !! thanks for this KILLER compilation…great artists super trks inside. )all da best.! Tnks for this masterpiece alf!! cenotes and annoyingNinjas must be a bomb also! Awesome! Can any one explain ‘forest’ psy? What a nice and beautyfuly achieved Cover Art!!! After many many listens, really have to say how utterly mindblown i am by this compilation, especially the last three tracks, gnomadelic.. utmost thanks to all involved, and keep it up cenotes :D!!! i am enjoying this!great work guys! Krussedull. Alberts Journey. That is THE ultimate track. That dude is the man. Greetings from Ukraine (Lugansk region). Outstanding psychedelic music thank you so much! woo hooo!!! and thank you all. great comp with equally great production. just hit play and go dance…HARD. Gonna play this one in the woods for sure. I don’t really ‘get’ darkpsy to be honest….just seems like irregular beats and monotonous throbbing bass-lines. kila realy good to get such releases for free mor plz!!!!!!!!!!!!!!!!!!!!!!!!!!!!!! big thanks for this compilation, i enjoy it since a long time and never gets boring in my ears! heavy psychedelic music… hope more of this will coming! this is definitly a 5 star album – so it’s perfect! Albert’s Journey is a beautiful epic! Parus – Vodameri, totally dark epics.